Let cookie dough stand at room temperature 10 minutes to soften. Meanwhile, heat oven to 350°F. 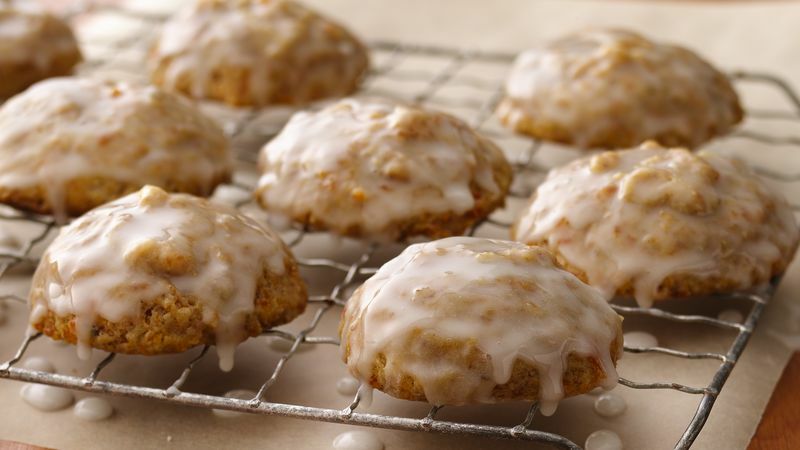 Spray cookie sheets with Crisco® Original No-Stick Cooking Spray. In food processor, place pecans, apricots, preserves, cinnamon and cloves. Cover; process with on-and-off pulses 20 to 30 seconds or until pecans and apricots are finely chopped and mixture holds together. In large bowl, mix pecan mixture and sour cream. Crumble cookie dough into pecan mixture, stir with wooden spoon until well blended. Stir in flour until well blended. Drop dough by 24 heaping tablespoonfuls 2 inches apart onto cookie sheets. Bake 12 to 15 minutes or until light golden brown. Cool on cookie sheets 2 minutes; remove to cooling racks. Cool completely, about 20 minutes. Place waxed paper under cooling racks. In medium bowl, stir powdered sugar and milk until smooth. Dip tops of cookies into glaze; place on racks and let stand 5 minutes. Dip cookies again; let stand 5 minutes longer or until glaze is set.